The new Mizuno performance trainer, the Wave Shadow, is intended as a direct replacement for the to be discontinued Wave Sayonara. It shares similarities with it weighing about the same and having a similar 28mm heel/18mm stack but dropping 3 mm in the heel and 1 mm in the forefoot so now a more modern 8mm vs. Sayonara's 10mm drop. 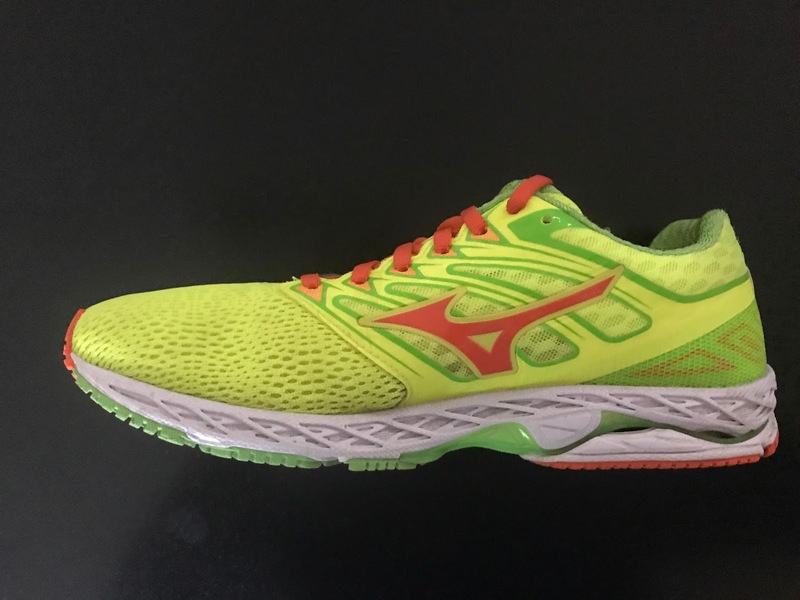 I did not run the Sayonara but have run the Wave Rider 20, a shoe where the the massive 12mm drop and firm heel is not to my liking. No such issues of very noticeable drop with the Wave Shadow. The Wave Shadow is true to what is imprinted into the outsole: "Smooth Ride". reasonable $110 price for a beautifully crafted, high quality shoe. If I have a few small knocks it is they are that they are a bit to rigid and firm from heel through the mid foot, they are a bit slappy and they weigh a touch more than others in the category such as adidas Boston or Nike Zoom Elite. This is one sharp looking, beautifully crafted shoe. The look of the front single piece mesh with many small holes is particularly striking as is the rear collar which combines decent cushion with a slightly raised knit pattern which I assume helps keep the heel from slipping and helps evacuate moisture. Unlike the Wave Rider, or the Sayonara, the dated and stiffening use of stitching is eliminated except over the bottom of the mid saddle over the top of the foot to either side and alone the lace up. The saddle and heel perfectly and securely hold the foot with no pressure points. The tongue is a bootie construction with the stretch bootie ending at the tongue level at the 3d lace hole from the top but angling lower down towards the heel. The tongue is very lightly padded and of the same small holed stretch mesh as the forefoot. One can easily pull the tongue back and get a secure relatively pressure free fit on lace up but I would wish for a touch more padding over the lace up. The forefoot is a thing of beauty, a single piece of mesh, the stretch coming from the many small holes as much as the material itself. There are no overlays at all up front and just a very subtle stiffening up front on the inside in place of a toe bumper. The overall fit is what Mizuno calls Dynamotion and it is effective and comfortable. At first I thought my true to size might be to short but after about 10 miles, I assume due to the sock liner packing down, they evolved to a perfect if a bit short fit at the very front tip. The stretch mesh should accommodate a variety of foot shapes although this is not a particularly wide platform or upper. I would characterize the fit as a comfortable performance fit, secure but not constricting. The midsole is made entirely of Mizuno's new U4icX midsole material, the Sayonara had U4ic. 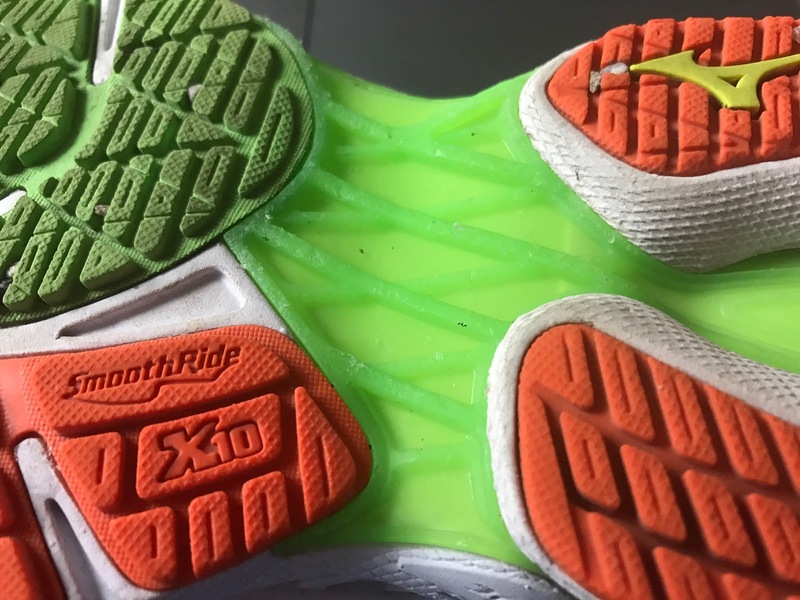 The firmer Wave Rider 20 has softer U4icX at the heel as a layer under the U4ic. The newer midsole material now used for the entire midsole is lively and a touch bouncy and not as firm and dead as the older flavor material. The approach and underfoot feel reminds me of Saucony's transition from SSL EVA to PowerFoam for the Ride 10 (review ). Power Foam was also material formerly used in more limited fashion other shoes. We also see triangular shapes carved into the sidewalls front to back and on all sides, deeper than New Balance Fresh Foam's. and I think more noticeable and effective. These shapes contribute to softening the shoe at the edge easing landing then transition and finally assisting toe off. The outsole's many tightly spaces grooves of different depths, although on the shallow side compared to say the Saucony Zealot ISO 3 (review) contribute to fantastic stability up front but also decent flexibility. 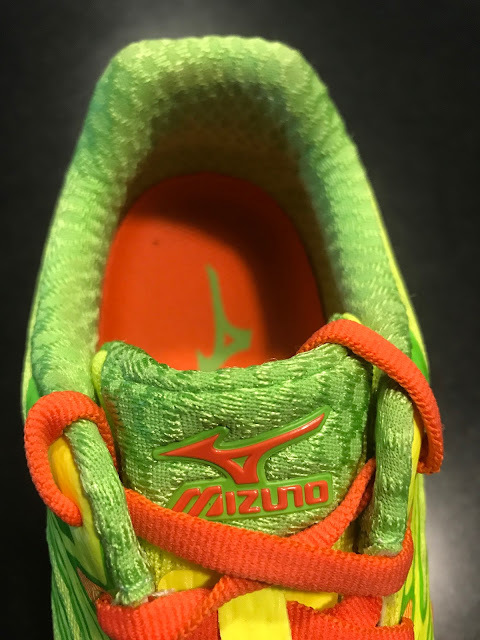 And this despite all the rubber, and it is not all Mizuno's X10 durable rubber with what feels like a slightly softer version of X10 in the green area of the forefoot. Durability should be outstanding. We have seen no wear at all after 40 miles. This outsole creates a great balance of firm stabliltiy under foot and cushion when it combined with the V4icX midsole with its deep release pattern on the midsole walls. What about Mizuno's trademark Wave plate and the heel? While the very first run reminded me of the Wave Rider's very firm and stiff heels after a few runs things seem to soften and maybe the plate settled into the foam to better match my strike patterns? The Wave plate in the Shadow is different from the Sayonara. 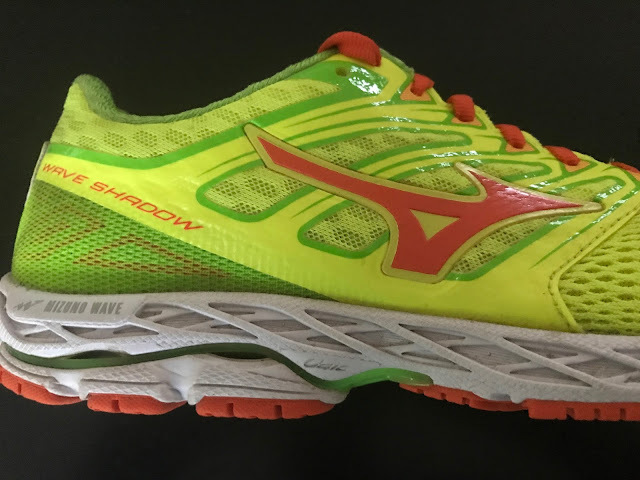 The Shadow features the same CloudWave technology seen in newer mizuno footwear (ex:Rider 20). It is a redesigned elastic, thermal plastic wave that should offer increased responsiveness and snap. The new CloudWave plate here is more flexible and more sculpted than Wave Rider's and while torsionally rigid there is some ability to twist the shoe. I wish it was a little narrower, less massive, more open under the mid foot as the adidas Boston 6 (review) and Salomon Sonic Pro 2 are. Compared to Salming which sets the bar high with their angled distinct ballet line toe off the transition for me from their Torsion Efficiency Unit is more abrupt less of a piece than in the Shadow. I think this may be because Salming extends its plate further forward on the lateral side and doesn't sculpt the side walls as much. The adidas Boston 6 is more flexible than the Shadow towards the very front of the shoe but here again the Torsion plastic extends further forward on the lateral side so while there is more rubber coverage on the Shadow overall the transition and toe off is slightly smoother and more fluid for me especially at slower paces. The ride is smooth, very smooth. At any speed the sensation is of smooth consistency with a distinct firm and stable feel to the heel but not a harsh one. The heel while firm and very stable is cushioned at the same time. I do heel strike and prefer a stable heel with a quick transition at any speed. The transition is without much friction slow or fast but I do think the Wave plate could be narrower under mid foot. Despite the 17mm forefoot stack, less than I prefer, Shadow has not been fatiguing as say the Boston 6 (due to softness of the Boost) or New Balance Zante (continuous not very segmented outsole) both with similar forefoot stacks. I attribute this to a combination of the midsole foam and its sidewall patterns and the variety of foot strike and push off patterns accommodated by the highly segmented full coverage stable outsole. With many shoes to test, and to chose from, I have been consistently reaching for the Shadow, even when other review deadlines are looming, and for most types of runs from slower recovery to tempo. I have run 40 miles so far in the Shadow. A firmer ride for sure, especially at the heeL. Shadow is more than adequate in the cushioning if you department if you like a firmer more responsive ride with the bonus of great stability. 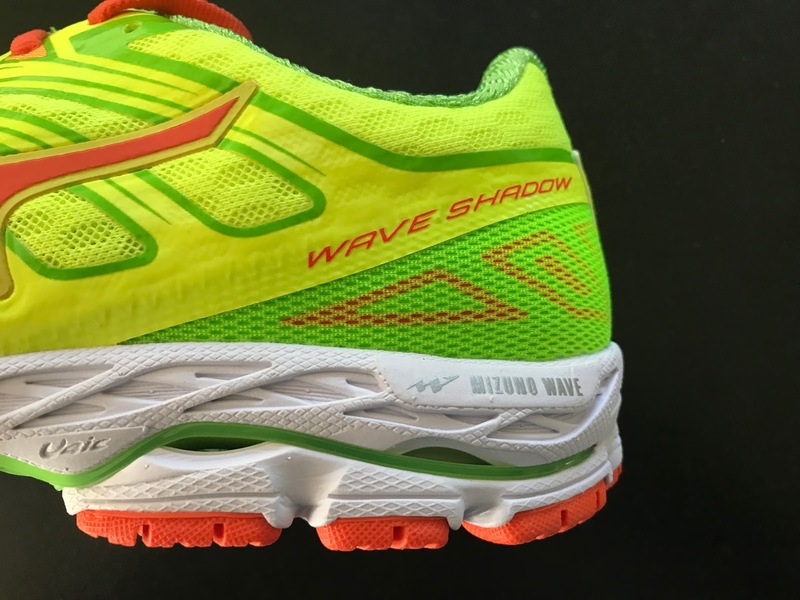 Mild over pronators could consider it as a race day and tempo shoe as the Wave plate acts as a mild stability element but one neutral runners such as me should have not problem with. Some stability when things get sloppy late in a race is a good thing. It is smooth and accommodating at any pace, even slow, something shoes in this class often can't achieve. If you seek a more natural ride you likely will be looking elsewhere as the Shadow keeps you tracking and secure from upper to outsole and has a reasonable but still fairly substantial 8mm drop on top of the firm Wave plate. 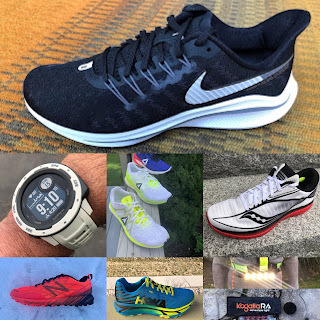 If I could only have one shoe for all purposes from training to racing it would certainly be near the top of my current list. -.035 for weight, Wave Plate width under mid foot, and slight over firmness at the heel, all caused I believe by the Wave plate. Slimming down the Wave would help this shoe be nearer a 10. I compare the Wave Shadow to shoes all weighing between 8.25 (Brooks Asteria) and 9.31 oz (Brooks Launch). The Shadow weights 8.9 oz. In addition to running all these shoes previously for reviews I took them out side by side with the Shadow, each in turn, in one session. The Sonic Pro 2 is the closest comparison of the bunch for me. At 8.4 oz it is lighter. It has a similar responsive firm ride with shock better attenuated than Shadow from its heel Vibe insert (RTR article about Vibe here). The upper is all of a piece in feel but not quite the dialed fit of the Shadow with its contrast between snugger mid foot and soft accommodating forefoot. The Salomon's Pro Feel mid foot thin stiffener plate and less segmented full coverage forefoot rubber leads to a somewhat smoother and more fluid but also less responsive transition. Both shoes can do double duty as trainers and racers with the Salomon more versatile if you have some trails with your road work and the Shadow more refined and slightly snappier and more cushioned. Another close comparison. The Shadow forefoot fit, while similar, is better executed and more accommodating and its mid foot more secure. The Boston 6 heel with Boost midsole and Torsion plastic is clearly softer and not quite as stable. The Boston's forefoot flex favors speed with the Boost up front leads to a slightly less stable forefoot. At 8.4 oz the Boston is slightly lighter. Those with good form and no pronations issues would lean to the Boston 6, others seeking a more substantial stable yet lively responsive shoe to the Shadow. 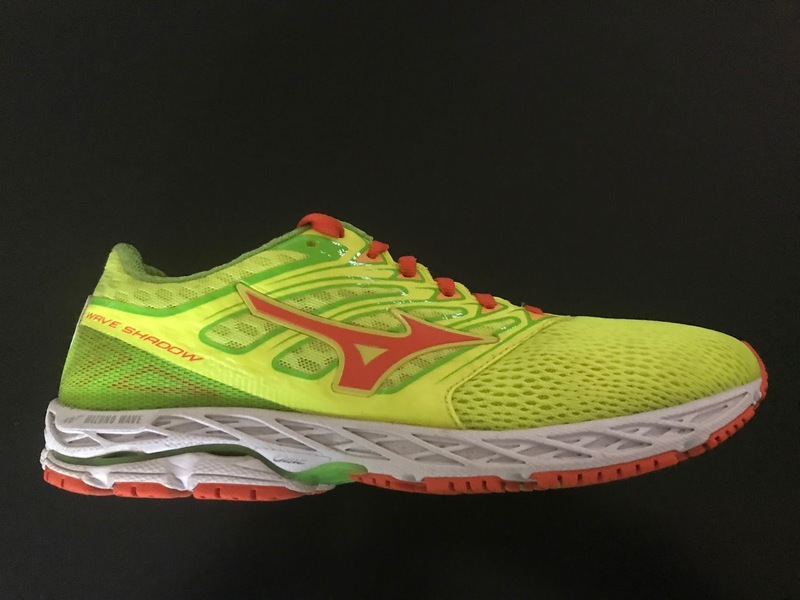 I include the lighter (8.25 oz) more race focused Asteria as it to focuses on heel stability with an firmer foam insert at the heel for pronation support. The Asteria also has a great forefoot upper, narrower than Shadow but accommodating. Noticeably firmer, it doesn't have the any run versatility of the Shadow. Of all the shoes in this comparison the Zealot has the softest underfoot, most flexible forefoot and the roomiest upper. The front of the Zealot does not have the snappy firm responsive yet cushioned ride of the Shadow. Upfront the Zealot reminding me of a more cushioned older Kinvara. Foot hold is decent and especially accommodating at mid foot with the ISO system, maybe to accommodating for some and me but great for higher volume feet. Those seeking a more snug race style mid foot fit in a performance trainer will lean to the Shadow. The heel area is more cushioned than the Shadow and combines lots of firm rubber with nice softer Power Foam. Put the heel feel of the 8.6 oz Zealot on all the rest of the Shadow, including upper, while reducing the Wave plate to a more svelte less wide at mid foot design and Shadow would be an ideal shoe for me. The heaviest of the comparisons at 9.3 oz the Launch has a great upper combining decent hold, room and comfort. Under foot is is softer than the Shadow with an easy and not particularly snappy response. Clearly leaning towards training and not racing and up tempo it is more suitable day in day out and for heavier mileage than the Shadow. But.. it is not as much fun or as elegant. The Wave Shadow was provided at no charge. The opinions herein are entirely the author's. For dozens of in depth 2017 shoe and gear reviews visit our index page here. 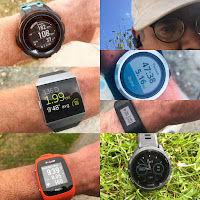 Purchases through the links below help support Road Trail Run. Thanks! Sayornara 4 on Sale for $63.88! Will there be a Wave Sonic review forthcoming, by chance? Strava Celebrates 1 Billion Activities Shared!